So far in Shirt Tales we’ve enjoyed some truly special shirts. In chapter 1, we looked back on the golden era of shirt design. Holland ‘88, Man United 1990 away, Arsenal 1991 away, the list is long and beautiful. Then, in chapter 2 we recounted the rise of Nike with their exploits in Dortmund, Paris and beyond. Now we’ll take a look at the early career of one of the greatest of all time, to see how the shirt industry flourished and then matured, to great effect. 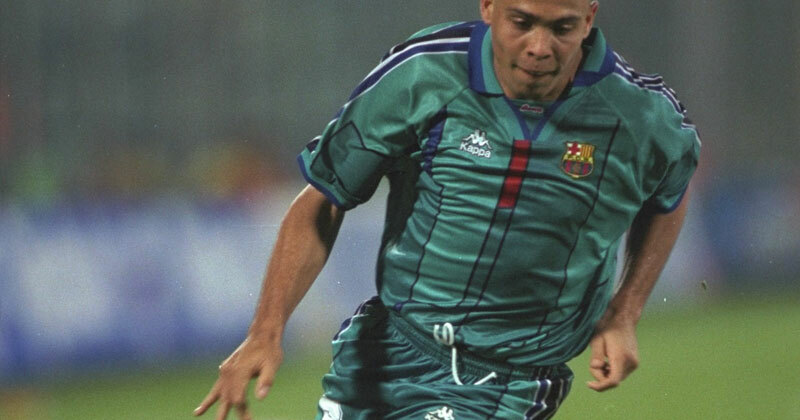 You could say Ronaldo Luís Nazário de Lima’s destiny was written in the stars, or at least his shirt hinted at it. 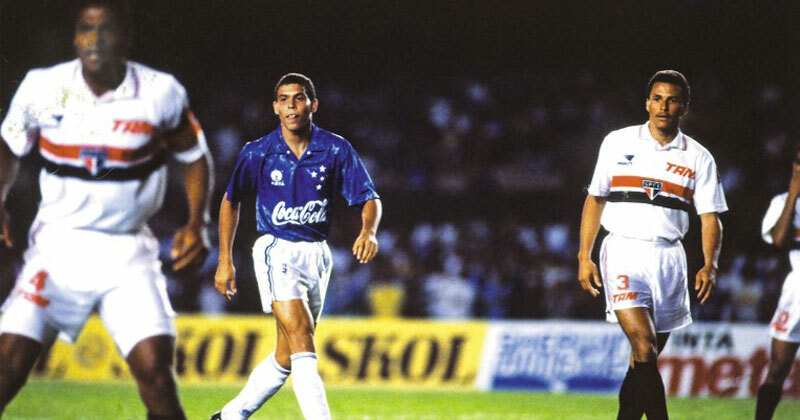 Beginning his professional career at Cruzeiro, Ronaldo’s first kit had everything you want in a 90s shirt. Every inch of the deep blue number, made by Brazilian brand Finta, was covered in stars. The most notable constellation of all was the Cruzeiro crest itself, a glorious minimal 5 star arrangement which is easily one of my favourite badges of all time. How do you top that? With a sponsor for the ages. Nothing says 90s more than a food and drink brand on a shirt. In today’s betting saturated sponsor landscape, the likes of 7UP and Newcastle Brown Ale look positively other-worldly. And Ronaldo and Cruzeiro got to promote the biggest brand of them all, Coca-Cola, as jarring as it was seeing the logo against a colour other than red. As Ronaldo crossed the well-trodden divide between South America and Europe, things didn’t let up both with his level of play and the quality of shirts he wore. 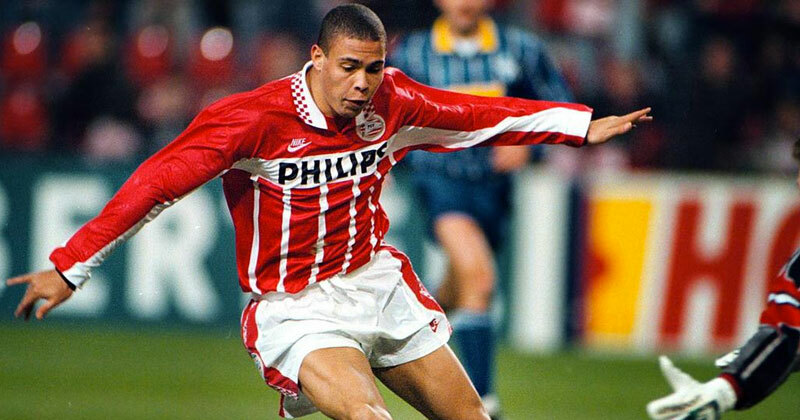 Joining PSV on the advice of his compatriot Romario, Ronaldo pillaged his way across the Netherlands scoring 35 goals in 36 games across all competitions in his first season. His shirt that year was a classy adidas design, with the iconic red stripes of PSV trimmed with white pinstripes. Interestingly, in Ronaldo’s second season, PSV switched over to Nike (a familiar move…), with the resulting kit surpassing its predecessor. There’s a lot to like about this shirt, starting with the old school Nike logo (with text and swoosh) and the PSV crest both placed bizarrely high on the shirt. Perhaps they were trying to get as close as they could to the collar, a marvellous checkered design in an area of the shirt often devoid of creativity. here’s something charming about the rest of the shirt too, thin white stripes rise up from the bottom only to be cut off by a thick white band with the Philips logo written across it. It’s abrupt and lobsided and probably should’t work, but it’s the sort of shirt which has aged really well thanks to its distinctive elements. It cost Barcelona just shy of $20,000,000 to prise Ronaldo away from PSV, and their investment, although only enjoyed for 1 year, paid off handsomely. Not only did Ronaldo continue his ludicrous scoring record in Spain, he did so in a way which separated himself from all those around him. He was the perfect blend of pace, power and precision. And once again we got to see the player who would soon be dubbed O Fenômeno line up in style. Barcelona shirts at the time were made by cult Italian kit makers Kappa, and their choice of uniform for Ronaldo was exactly what the doctor ordered. The home shirt had all the traditional elements you’d expect from a Barca shirt, but the away was where the real excitement was found. Kappa’s first away shirt for the Blaugrana in 1992 featured a distinctive minty teal shade, with stripes of red and blue coming over each shoulder in a similar look to many adidas shirts from the time. But for their 1996 away shirt the brand took this idea and then built on it in a big, unexpected way. It was almost as if someone had seen the ‘92 shirt, and decided to wallpaper over it. Best of all, this was done so hastily that the pieces didn’t quite line up. Instead, they interlocked in a way which looked haphazard, with cracks of red and blue appearing in the gaps. Completing the look were subliminal Kappa and ‘Barca’ logos throughout the shirt, though these was not seen in European matches due to UEFA regulations. This shirt defied convention, even for the 90s, and it remains a personal favourite of mine for its sheer audacity alone. 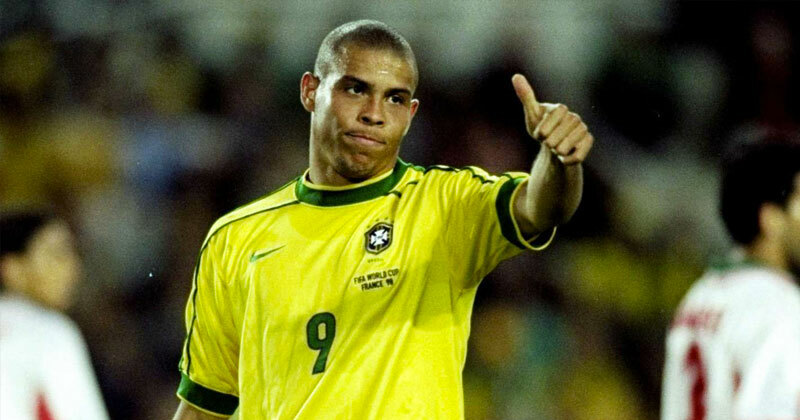 Doing the shirt justice was of course Ronaldo, who was performing well at every opportunity he was given. It just so happened that the industry was about to explode from a commercial landscape too. Predictably, O Fenômeno would remain an integral figure in the story. The year was 1998, and the world was expectant. Going into France ‘98, Brazil had a lot of things going for them. The defending champions had undergone something of a renovation in the 4 years since their 4th World title, and the most exciting of these new players was Ronaldo. Just months before the tournament Ronaldo played a key role in a UEFA Cup win for his new club Inter. And with all that had gone before him, he was the poster boy of a Brazil side even at a time when other mercurial talents like Rivaldo and Roberto Carlos were beginning to make waves for the Seleção. Not only was this a supremely gifted crop of Brazilian players, football was changing in other ways. TV viewership had reached record highs in 1994, and the growing globalisation and monetisation of the game was palpable. What’s more, the Brazil team were the main feature of Nike’s now legendary “Airport” advert. Directed by John Woo and shot in a Rio de Janeiro airport, the popularity of this ad was yet another symbol of how the game was rapidly maturing. From a shirt perspective, what would Nike dial up for Brazil in ‘98? The result was much more of a long-term investment rather than a high stakes gamble. After the freedom of the early 90s, we saw natural swing back to more considered designs. Far from being a purely negative change however, this was symptomatic of the fact shirts were fast becoming much more of financial concern. For a shirt to be consumable by the wider public (and not only for fans of the team), it had to be as stylish off the pitch as it was on it. And Brazil’s 98 shirt was exactly that. A simple green crew neck collar was balanced out perfectly with matching cuffs, whilst additional green trim on the shoulders added enough detailing to keep things interesting, without distracting too much. This wasn’t going to turn heads as quickly as Cruzeiro’s ‘93 shirt, or Barca’s ‘96 away, but it looked equally superb with a pair of jeans as it did a pair of Mercurials. It’s too simplistic to say that plain shirts sell better than crazier designs, but Nike understood one thing well: celebrity sells. The biggest traction in the commercial would be found through personalities and Ronaldo was the personality in football. He was a marketable superstar, dominating the game everywhere he went and playing for the biggest and most recognisable nation in football at a time when more and more people were watching. Some brands were still pushing the boat out from a design perspective, with Kappa notably creating designs for the likes of Jamaica and South Africa which stand out even amongst all the craziness of the years previous. However 1998 taught us that the shirt industry was very much becoming exactly that, an industry.